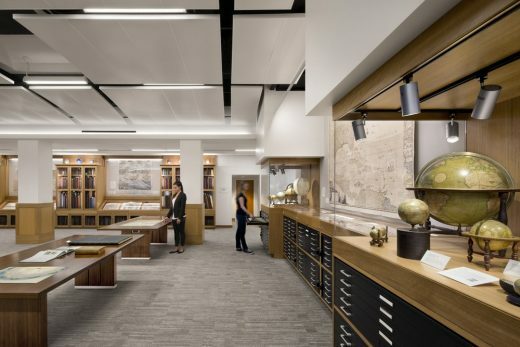 The project renovated the fourth floor of Stanford University’s Green Library to house David Rumsey’s rare map collection. 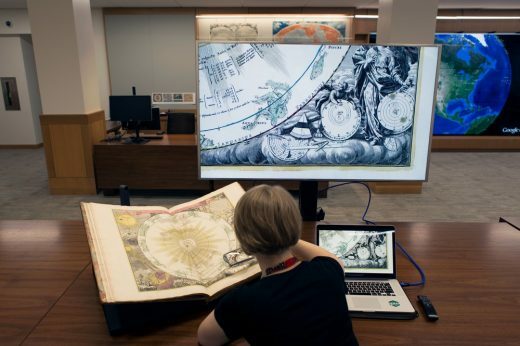 The collection was started in the mid 1980s and contains more than 150,000 maps, and includes atlases, wall maps, globes, school geographies, pocket maps, books of exploration, maritime charts, and a variety of cartographic materials. 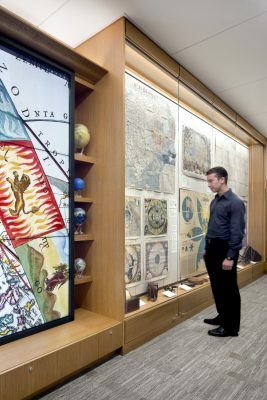 The 3,975 square-foot space showcases Mr. Rumsey’s collection and his dedication to providing an accessible and interactive experience through visualization and geospatial technologies. 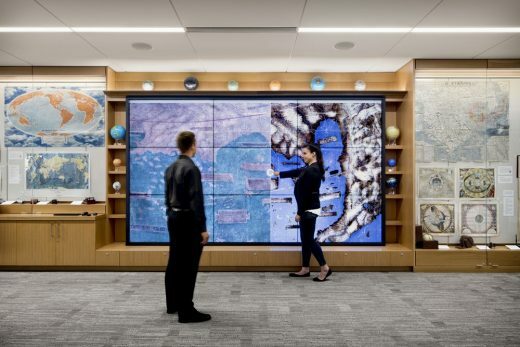 The design weaves together the stunning visual impact of the maps into the experience of the built environment. 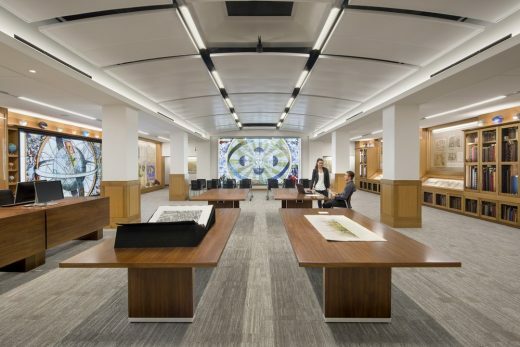 To reach the Center, the visitor ascends three flights of stairs from the library rotunda. 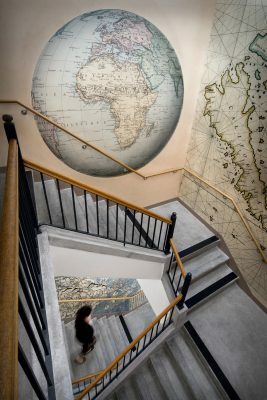 The stairwells are wrapped floor-to-ceiling in maps—from an isometric map of Manhattan to a map depicting the heights and lengths of the world’s mountains and rivers. Inside the Center, glass doors are decorated with white digital prints of maps. On the east wall, a custom display presents the Popple Map (1733), the first large scale map of North America, and one of the signature artifacts of the collection. The design allows for incredible versatility of the exhibits, with two 16’ x 8’ walls of uninterrupted display, cases that allow globes to be exhibited and easily interchanged, and custom-made shelving and casework to house the collection. To make the technological element of the collection accessible to researches and laypersons alike, there are two large touch screens (7’x12’ and 9’x16’), which allows users to create, overlay, and visualize cartographic materials through technology that encourages interdisciplinary cross-fertilization of research. 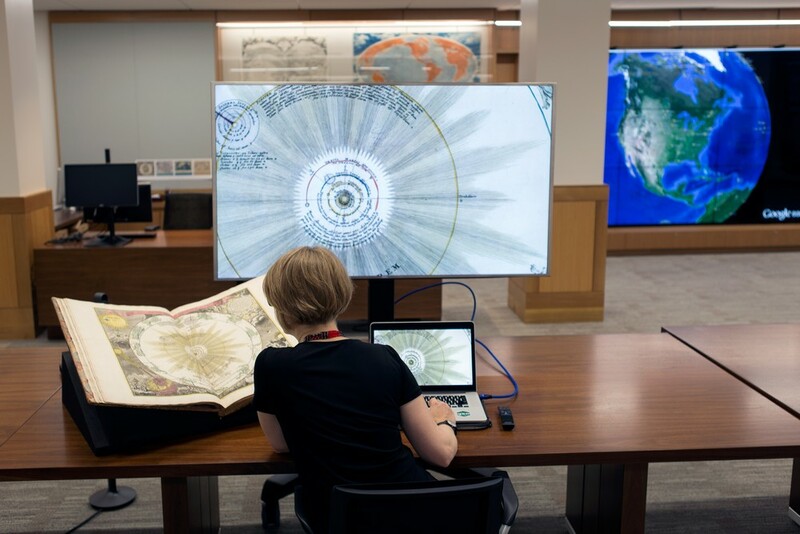 It is the university’s goal that this center’s physical materials and data-based tools will forge new paths of study and instruction in the cartographic and geospatial realm. 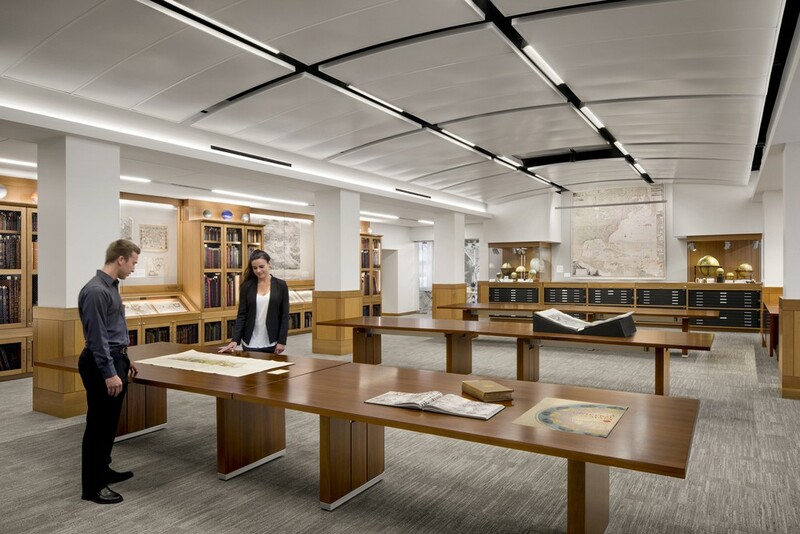 Structural Engineer: Forell/Elsesser Engineers, Inc. 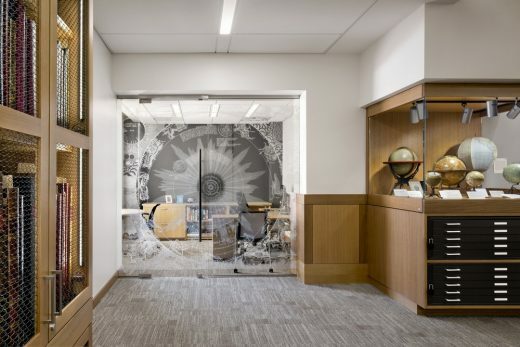 Mechanical Engineer: Interface Engineering, Inc.
Electrical Engineer: Interface Engineering, Inc.
Acoustical Engineer: Charles M Salter Associates, Inc.
AV: Charles M Salter Associates, Inc. 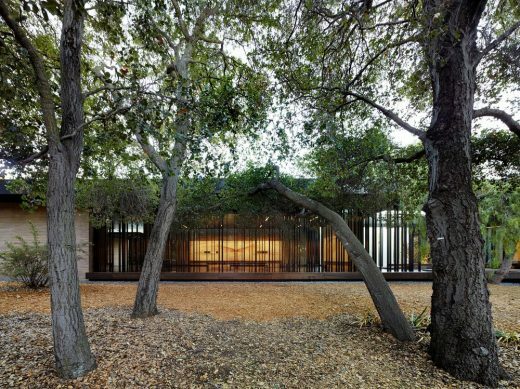 Contractor: Charles M Salter Associates, Inc.